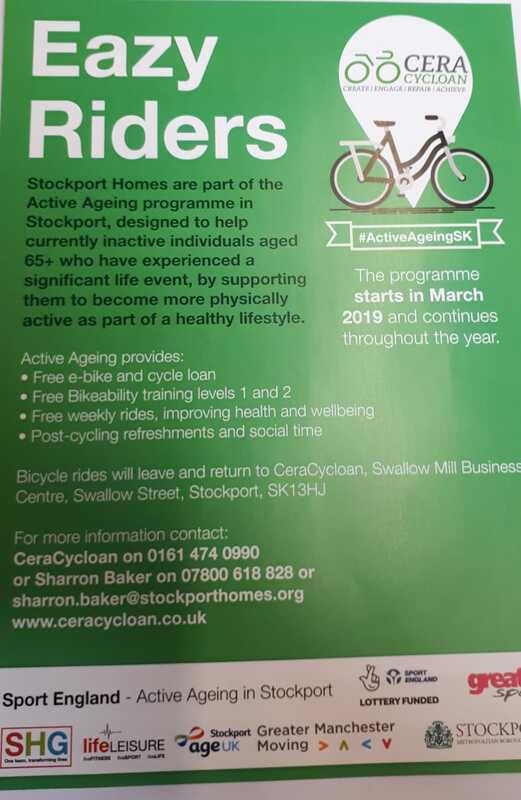 Our rides are short and are conducted weekly on Saturdays in partnership with Stockport Community Cycling Club (except Bank Holidays) see dates at the bottom of this page for all CERA Cycloan rides, visit the Stockport Community Cycling Club link for even more rides. Rides are introductory, fun, inclusive and slow but evenly paced (we will only go as fast as the slowest). Before each ride we will teach and conduct a bike M-Check to ensure your bike is safe for you to use, this also helps you to understand your bike. 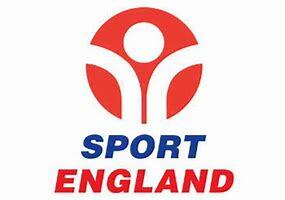 After each ride we will have a short time for socialising, tea / coffee and biscuits. Our rides are approx. 2hrs long including M-Check time and social time. We have 10 bikes in total we loan to people to use on our organised rides, 2 e-assisted bikes 3 step through bikes have been supplied via Sport England funding in connection with the Sport England Active Ageing programme in-active over 65’s who take part in the Active Ageing Manchester University research evaluation. To support people under 65 yrs CERA Cycloan also provide 5 further cross barred mountain bikes to add value to this health and wellbeing initiative and ensure cycle access for all. Cornerstone, 2 Edward St, Stockport, SK1 3NQ by telephone: 07800 617 828 or via email: sharron.baker@stockporthomes.org who will be more than happy to accept and action a referral into the programme. 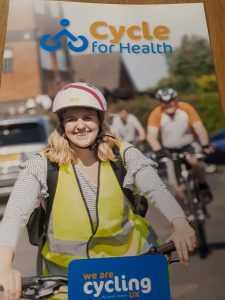 Sharron will also arrange free bikeability training for individuals who need to build confidence with riding a bicycle. To loan one of our fantastic bicycles terms and conditions do apply so please enquire before expecting you will be loaned a bike, you can contact us by telephone: 0161 474 0990. Once you have contacted us we can discuss your needs, age and health and fitness levels you will need to complete a our disclaimer form before we can authorise a loan of one of our cycles and you will need to leave us with the following documentation listed below to loan a bike. Once this is in place you can ride to your hearts delight either ride independently, join us on one of our supported rides (listed below) or join a Stockport Community Cycling Club rides. In fact there’s nothing holding you back from doing all three options and you’ll soon be feeling a great deal healthier whilst visiting local scenic places and building your social network. What if the weather is bad and we decide not to ride? You could be in our Cycle Mechanics workshop at no cost to you learning how to keep your bike in action or you could find yourself in our Arts and Design workshop having fun creating upcycled items whilst at the same time meeting like minded people. Please see below our 2019 ride dates, all rides meet Time 10am, Cycle Checks 10.15am we ride at 10.30am prompt . Where will our rides start ? 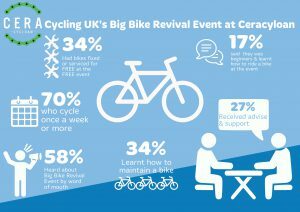 All rides will start from CERA Cycloan, Ground floor in Swallow Mill Business Centre, Swallow Street, SK1 3HJ. Riding round local area whilst cutting through Vernon & Woodbank park.